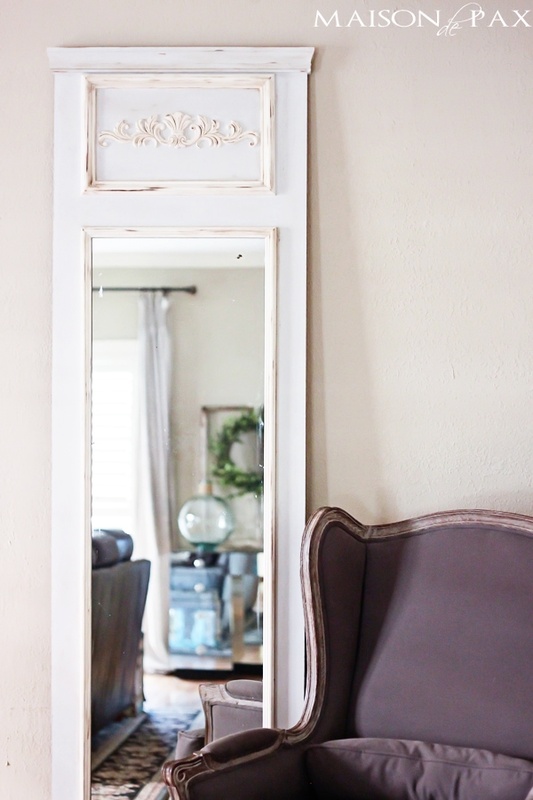 I am humbled and honored by all the encouraging responses from my DIY Trumeau Mirror (tutorial here) I shared last week. You all are the best! 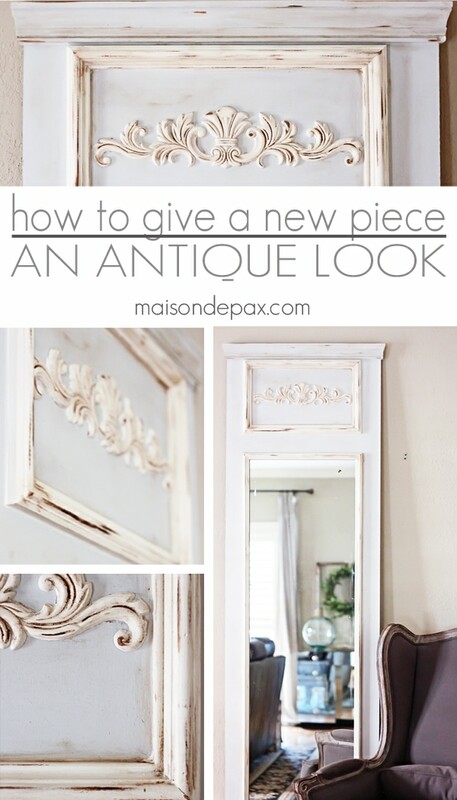 As promised, here is the tutorial on how I gave this new piece an antique look. 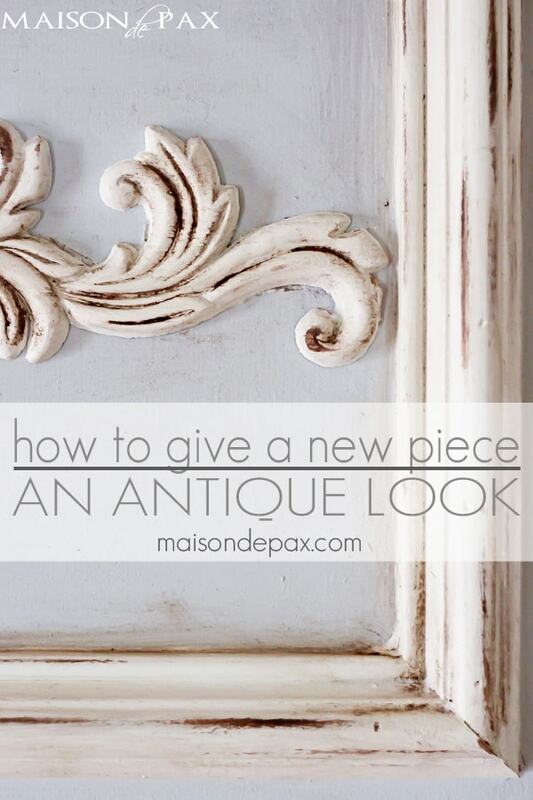 This antique paint technique could obviously be used on almost any piece, but I’ll be sharing specifically for this project so that you can recreate your own Trumeau mirror if you so desire. This post contains affiliate links for your convenience. Click here to read my full disclosure policy. Note: I began with a combination of raw wood (for the trim) and raw MDF board (for the main body). Give the entire piece 1-2 coats of paint (working to achieve full coverage). I used Lazy Linen on the body and Vanilla Frosting on the trim. 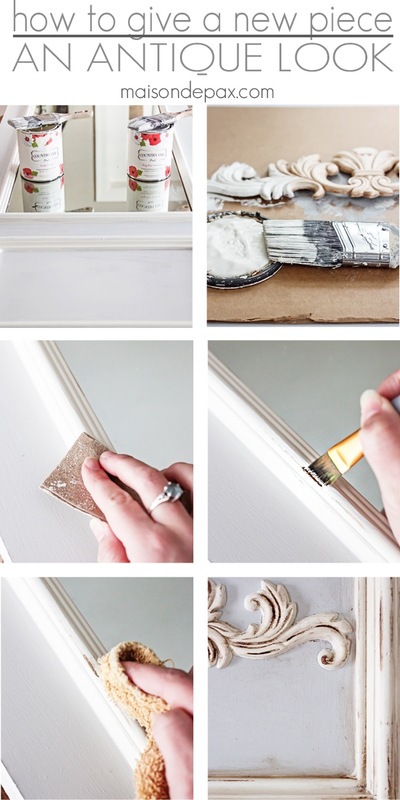 Paint any decorative pieces before you glue them on, if possible. It’s so much easier! Use your medium grit sandpaper on the trim (not the mdf!) to reveal the raw wood. Use your stain and artist brush to darken the raw wood you revealed with the sandpaper. Use your old rag to soften the look of the stain, making it look like natural wear to the wood underneath. (not pictured) Give the entire piece a coat of clear wax, using your wax brush or a rag. Using an old rag, rub dark wax all over – concentrating especially in the creases and corners. 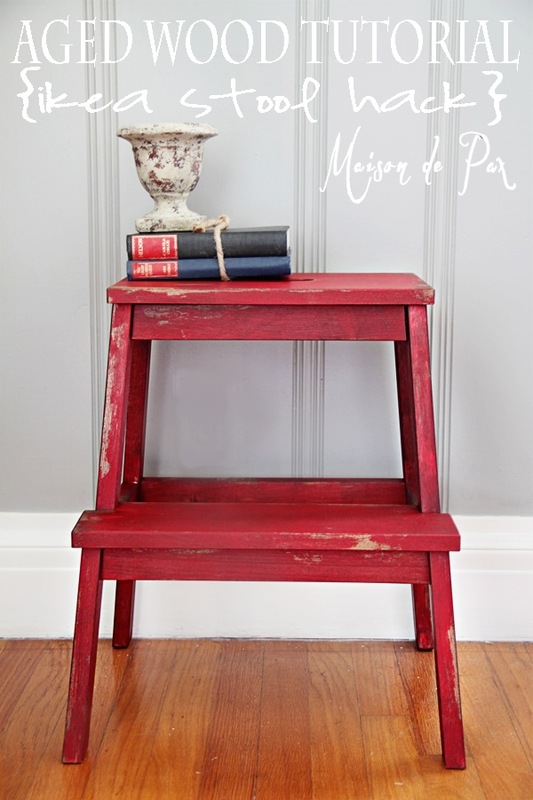 There are about a million and a half ways to achieve antique painted looks… I could have stained the whole thing dark and then painted and distressed it… But that sounded like a lot of work, I confess! This process still gave the effect of an old piece whose paint is wearing off, but I only had to stain the portions I revealed. This would also work well on a piece that was already painted. 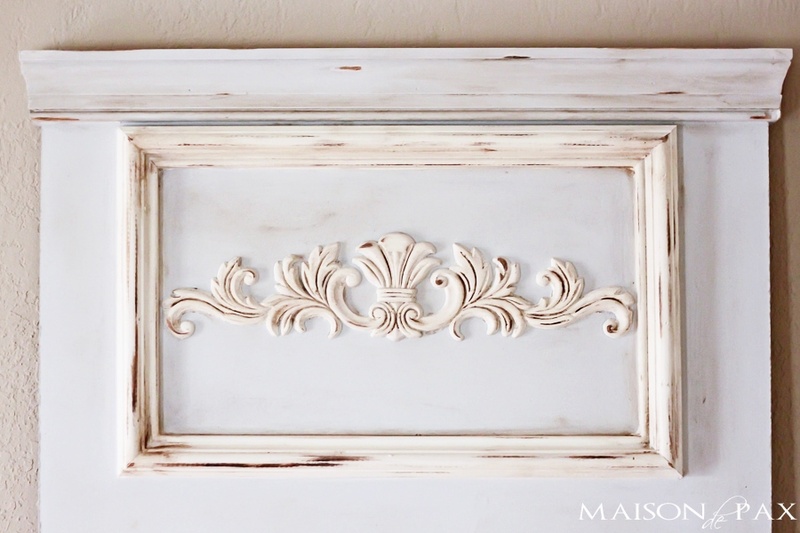 You can simply sand off a few spots (make sure it’s real wood underneath! ), add your stain, and then add some dark wax over the entire piece. I was inspired by this gorgeous Trumeau mirror by Horchow, and I’d say the overall effect was achieved. Any questions? Don’t hesitate to ask! Have my best tips on home decor, DIY, and life delivered directly to your inbox. 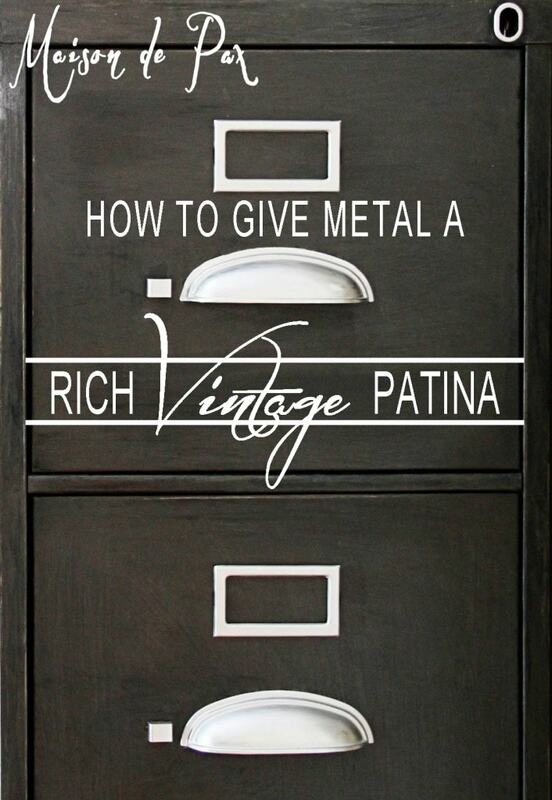 Subscribe and gain access to exclusive tips and printables! 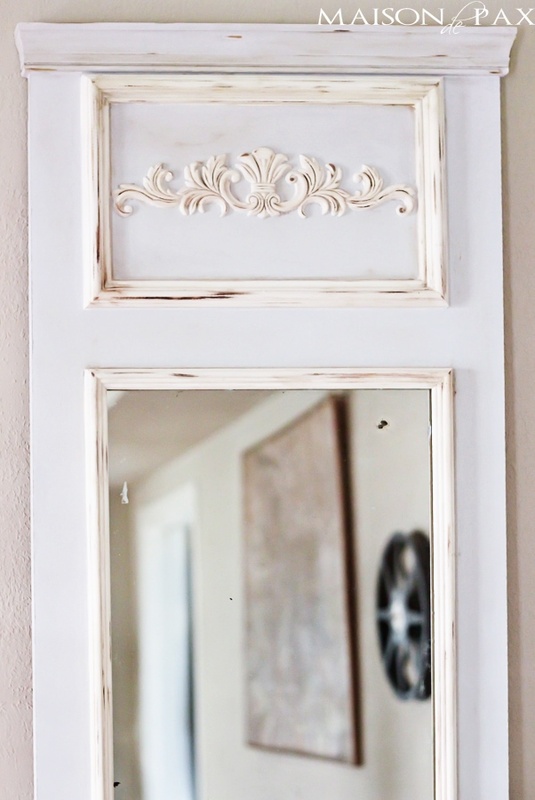 Love the transformations of the mirror and the stool…beautiful and amazing job! Love the red bench too, so much to try. Thank you Rachel. You really did a great job on this mirror, and thanks so much for your tips:) I’ve been dreaming up my own Trumeau mirror since you posted this! I’m so glad to hear it, Cindy! Thank you so much!! I truly do love that mirror, Rachel. You are a master painter Rachel! LOVE this technique. I’m itching to do another piece! I have wanted to give a piece of furniture an antique look for literally years but have been so afraid to even try ~ I love your tutorial! Pinning (so I don’t forget it) and hoping to do this very, very soon! Thanks for the tutorial. I really like that you give step-by-step instructions. 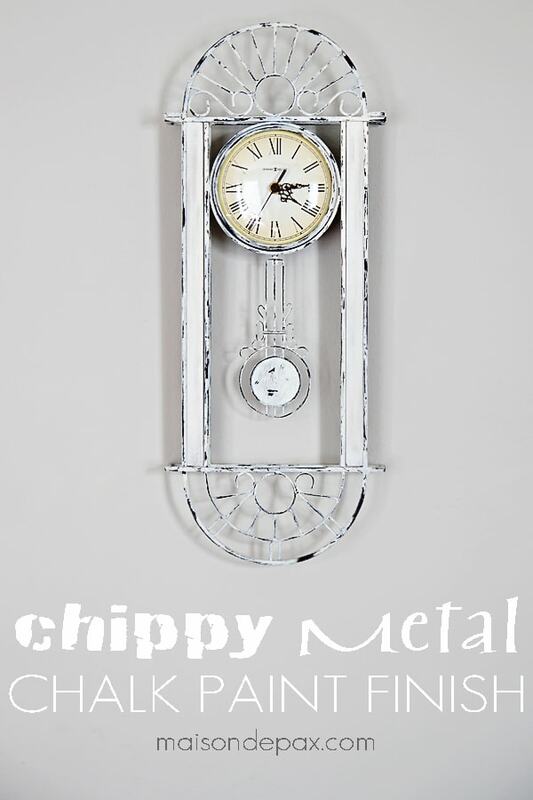 This is a great antique looking mirror, you have done a wonderful job on it. Thank you for the sweet comment, Tracy. I’m so glad you like the mirror! © 2019 Rachel Paxton (Maison de Pax). All rights reserved.